Sweet, juicy dates stuffed with cream cheese and almonds – all wrapped in crispy bacon – make the perfect appetizer for any dinner party. They’re easy to make and quite the crowd pleaser! Let’s bring some bacon into our lives. Not like it doesn’t exist there already, but bacon really does make everything better. I don’t know about you, but as soon as Thanksgiving is over our evenings and weekends fill up with one holiday event after another. We are pretty much going non-stop until New Year’s. They are the perfect appetizer because they are easy, transportable, and have the perfect combination of sweet, salty and savory. And they only have four ingredients! There’s nothing like a super tasty hors d’oeuvres that comes together so easily with only four items. 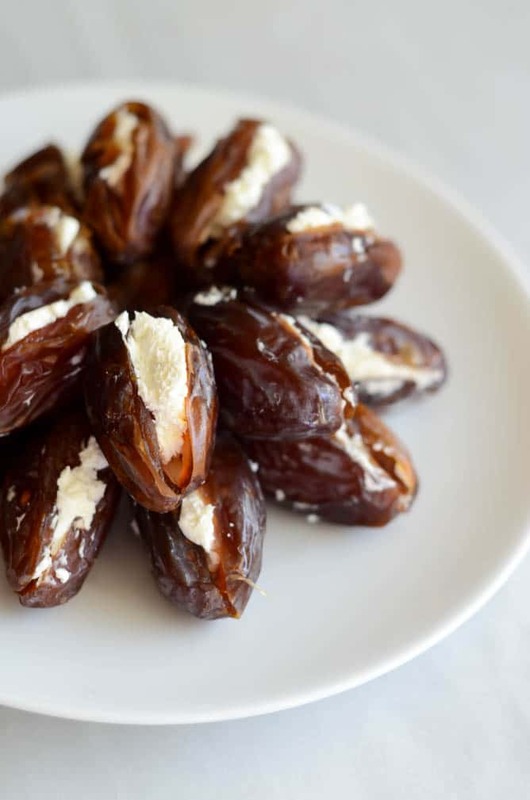 Simply pit the dates, dip your almonds in some whipped cream cheese, wrap them in bacon, pop them in an oven and, voila! 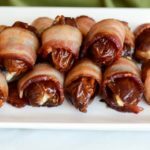 You have elegant, delicious Bacon Wrapped Stuffed Dates that will disappear as soon as you put them on the table. Be sure to get the freshest dates possible (those big, juicy bad boys that you get from a farm stand would be preferred, but I suppose you could use the ones you get from a grocery store if need be <see above where bacon makes everything better>). And speaking of bacon, you’ll want the biggest pieces possible, since you’ll be cutting them in half to wrap around the dates, bonus points for applewood smoked! I prefer to use whipped cream cheese, because it’s easier to scoop up with the almonds, but if you can only find regular cream cheese, that will work too. 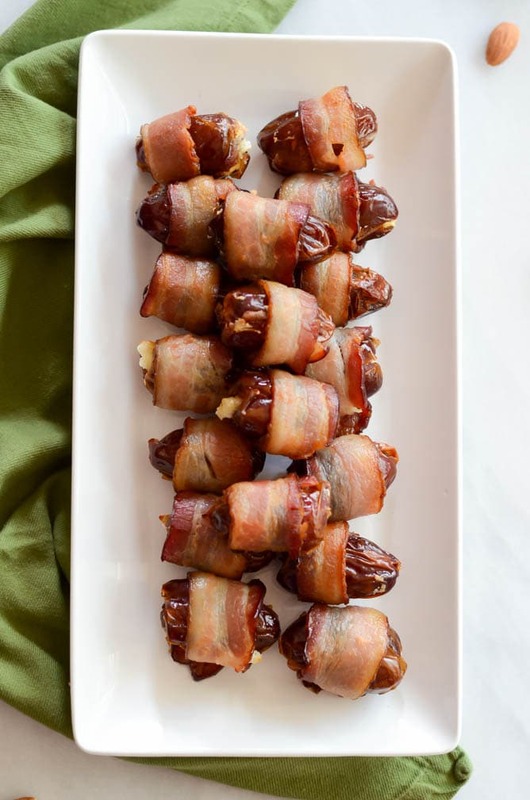 In reality, once these uber-yummy Bacon Wrapped Stuffed Dates come out of the oven, you’ll hardly have the patience to let them cool enough before you pop them into your mouth (proceed with caution!) They are so delicious and never last long as soon as they are at an edible temperature. What’s your go-to recipe for all of your holiday get-togethers? Is there anything you’re anxious to learn how to make? I’m always looking for new and exciting ideas! 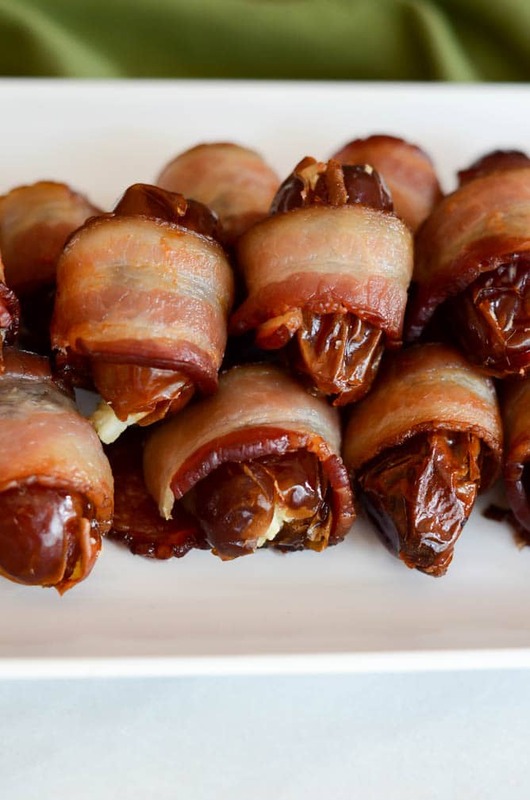 Sweet, juicy dates stuffed with cream cheese and almonds - all wrapped in crispy bacon - make the perfect appetizer for any dinner party. They're easy to make and quite the crowd pleaser! Place bacon on a large jelly roll pan (a baking sheet with edges to catch any grease) lined with aluminum foil. Put pan in an unheated oven and then turn oven on to 400 degrees Fahrenheit. Set timer for 14 minutes. After 14 minutes, remove the bacon from the oven. It should be most of the way done but still flexible enough to wrap around the dates. Lower oven temperature to 350 degrees. Remove bacon from pan and pour out excess bacon grease into a jar for proper storage (for later use) or disposal. Dip almonds in cream cheese and stuff each date with one cream cheese coated almond. 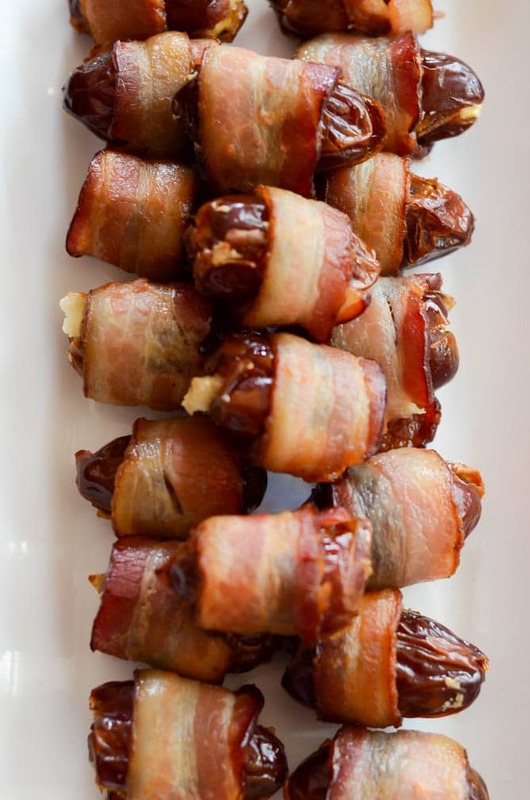 Wrap each date with one piece of bacon and place back on jelly roll pan coated with aluminum foil. Place back in 350 degree oven and bake for 18 minutes, or until bacon is at desired level of doneness. Wine Pairing Suggestion: Because of the strong flavors in these dates (think bacon, cream cheese, etc.) these hors d'oeuvres pairs fabulously with Cabernet Sauvignon. However, since they are perfect for a cocktail party or any other celebration, they would also pair just fine with a dry sparkling wine.